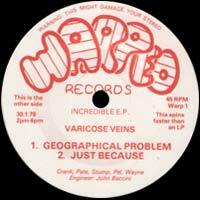 Geographical Problem appeared on Bloodstains Across the UK Vol. 2 and is sadly the only great track on here. Not much known about the band: “A very rare and early Punk release from 1978. The band hailed from Arlesey in Bedfordshire and released this one and only 3 track EP.“. Do the pogo! Loving these old UK punk 7″s you’re throwing at us! I certainly don’t mind hearing a bad b-side from time to time either. I understand that you want to hear all the tracks. But we have to make a decision if it’s worth posting regarding the bandwith. If you’re like me some of the post will wake up the hunter inside of you and you start searching for the other tracks. A fun hobby indeed. From Stevenage area. 250 copies. Sometime after the single was released (gigs & mail-order only)briefly played as The Veins with a changed line-up featuring a couple of future members of Fields Of The Nephilim. When the Veins split, band members Phil Parfitt and Alison Pate formed Orange Disaster, who would later become Architects Of Disaster and Perfect Disaster. Thanks for the info Steve! Have you or your dad saw that page about his band? Ah,there was already a link to that page in the text! My bad! yeah i checked out that one too, thanks. he hasn’t seen it yet but when he comes round next i’m going to play him geographical problem for sure! Leave an email here (take out a new one for this only as its public) and I will send MP3’s of the Incredible EP and some tracks we cut in a Studio. Say Hi to Alison from me. i have a copy of the incredible ep. got it in ’78; there was an ad in either sounds or nme and i sent off my £1.25 and had the record posted to me. it must have been delayed cos it had a scrap of paper with ‘ john, this is rare, and although the recording is rough, the songs are great. i may put it on ebay next year. if i do, i’ll leave a message on here in case anyone wants to bid on it. The B-side Hiroshima is infinitely better, with home made synthesiser sounds. I know someone who saw this band perform live! This not so good – oh well, back to the stamp collecting. R.i.p. Phiiip parfit a legend in his own mind.